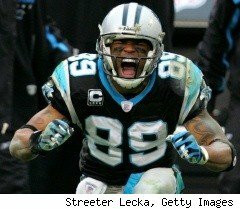 In the 3rd round of the 2001 NFL Draft the Carolina Panthers selected a small firey wideout named Steve Smith. Not even the cats knew what they were getting. This pint sized player took the field and turned this franchise and fan base on its ears. After reaching 4 probowls, 2 NFC title games, 1 superbowl, mulitiple playoff appearences, and a triple crown recieving title, the diminuative Smith’s future with the team is a mystery. His frustration is palpable. Hpoefully with a new coach and QB Smitty will honor the last two years of his contract and continue what has already been a stellar NFL career. If not expect him to return to his roots on the west coast, probably on a team that also wears the powder blue.